At the end of World War II, the country was energized. America had suffered through the Great Depression, followed by a long war fought against formidable enemies, who were defeated. There was a long, pent-up desire to move forward, to build homes, cars, infrastructure and continue with the ‘New Deal’ policies of dam building. Since the turn of the 20th century, a dam to create a water source for the county had been proposed. The Berryessa valley walls, on the southern side, narrowed to a rocky passage, called Devils Gate. It seemed like the perfect place to site a dam and block up Putah Creek to form a lake. The proposal sent a shudder through the long-time residents of the valley. How could someone want to destroy such beauty to benefit someone else? 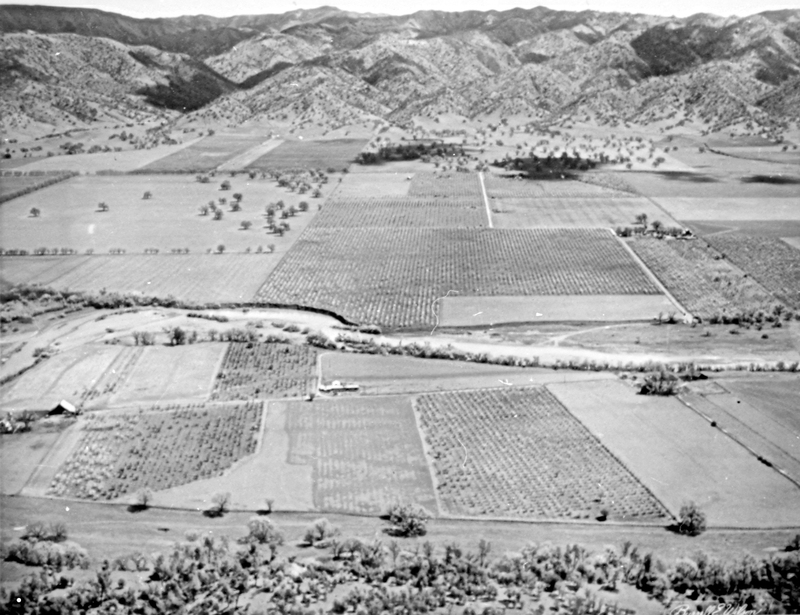 The proposal died during World War II, but then rose again in 1948 with the formation of the Irrigation District. 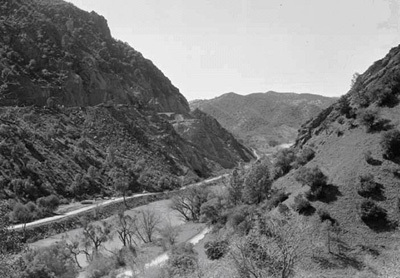 The Berryessa Valley prior to flooding by the Monticello Dam project. An Environmental Impact Report was not available to protect the land owners back then. 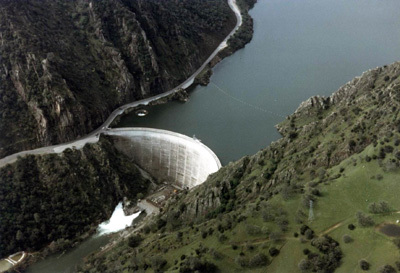 In spite of the protests, Solano County responded with petitions to Washington D.C., lobbying the Congress and Bureau of Reclamation for the need of a high dam at Devils Gate. Even the governor of California got into the act. Earl Warren, a long-time dam enthusiast, felt there ‘was imminent danger of a severe water shortage’ due to post-war expansion and stressed the urgency of construction to keep Travis Air Force Base, Mare Island and the Benicia Arsenal from running dry. Opponents countered that the military installations could easily be supplied from existing water systems. Solano County launched an “informational” campaign with buttons, bumper stickers and sound trucks, which were sent throughout the county to help ‘educate’ other residents on the need for a high dam. As ardent as the Monticello residents were, they were no match for the deep pockets of the county and the state. However, their plight caught national attention. Life magazine, which was a hugely popular publication, proposed to Dorothea Lang, world re-known photographer, and Pirkle Jones to do a story about the valley residents displacement. The article was never published in Life, instead Aperture magazine dedicated an entire issue to the project. The photos were later shown at the Art Institute of Chicago in the early 1960s. In spite of the sympathetic attention, the valley and its towns fate was sealed. The inevitable was staved off for another three years, when America became embroiled in the Korean War. Then, in 1953, Congress approved and funded the long awaited, and at the same time, dreaded project. The site swarmed with men and machines. About 325,000 yards of concrete were poured to form the dam, which rose 304 feet high and 1,000 feet long. All the buildings of Monticello - its commercial district, school, church and homes had to be razed. All the trees, grape vines, cattle fences, had to be cut to 6 inches or less. The pioneer cemetery was moved. The bridge over the highway to Napa was left in place because it was of such a strong material. All was lost as the rising waters washed over concrete foundations and steps to buildings that no longer existed. Before and after pictures of Devils Gate. Since the completion of the dam in 1957, it has provided water to the farmers of Solano County and enough water to service the population explosion as well. Even far-off Vallejo benefits with a gravity fed system. There have been dry years when the water levels have fallen, exposing old Monticello landmarks, but those are infrequent occurrences. The dam has been a poignant, ironic success.